Minimally invasive transverse aortic constriction (MTAC) conserves the essentials of regular transverse aortic constriction (TAC) while eliminating the use of a ventilator with tracheal intubation. It proves to be a highly desirable method for high-throughput studies on left ventricular overload, particularly in translational studies. Zaw, A. M., Williams, C. M., Law, H. K., Chow, B. K. Minimally Invasive Transverse Aortic Constriction in Mice. J. Vis. Exp. (121), e55293, doi:10.3791/55293 (2017). Minimally invasive transverse aortic constriction (MTAC) is a more desirable method for the constriction of the transverse aorta in mice than standard open-chest transverse aortic constriction (TAC). Although transverse aortic constriction is a highly functional method for the induction of high pressure in the left ventricle, it is a more difficult and lengthy procedure due to its use of artificial ventilation with tracheal intubation. TAC is oftentimes also less survivable, as the newer method, MTAC, neither requires the cutting of the ribs and intercostal muscles nor tracheal intubation with a ventilation setup. In MTAC, as opposed to a thoracotomy to access to the chest cavity, the aortic arch is reached through a midline incision in the anterior neck. The thyroid is pulled back to reveal the sternal notch. The sternum is subsequently cut down to the second rib level, and the aortic arch is reached simply by separating the connective tissues and thymus. From there, a suture can be wrapped around the arch and tied with a spacer, and then the sternal cut and skin can be closed. MTAC is a much faster and less invasive way to induce left ventricular hypertension and enables the possibility for high-throughput studies. The success of the constriction can be verified using high-frequency trans-thoracic echocardiography, particularly color Doppler and pulsed-wave Doppler, to determine the flow velocities of the aortic arch and left and right carotid arteries, the dimension of the blood vessels, and the left ventricular function and morphology. A successful constriction will also trigger significant histopathological changes, such as cardiac muscle cell hypertrophy with interstitial and perivascular fibrosis. Here, the procedure of MTAC is described, demonstrating how the resulting flow changes in the carotid arteries can be examined with echocardiography, gross morphology, and histopathological changes in the heart. The overall purpose of this article is to demonstrate how transverse aortic constriction (TAC) in mice can be modified to produce a simpler and more expedient surgery. TAC was first introduced in 19911 and enabled molecular biologists to study the cellular and molecular pathways that lead to hypertrophy in the left ventricle and to heart failure, particularly in small animals with manipulated genomes2,3,4,5,6. Despite its efficacy at producing the desired pressure overload, the technique is ultimately limited by the difficulty in performing the procedure and by its low survival rate. A surgeon conducting TAC must be able to perform endotracheal intubation, thoracotomy, and use artificial ventilation in order to prevent lung collapse1. Oftentimes, a simple and less invasive method is desired. As a consequence, minimally invasive transverse aortic constriction (MTAC) was devised3. Though the outcome (specifically, left ventricular hypertrophy) is the same, the procedure involves significantly fewer apparatuses and less damage to the animal. MTAC proves to be a desirable method that has a greater survival rate, above 90%, and has an operation time of only 15 to 25 min. The infrequent cases of death after successful surgery can be attributable to too-tight constriction of the aortic arch, resulting in tremendous left ventricular overload and fatal reduction of blood supply to critical organs such as the kidneys. After the procedure is completed, echocardiography can be used to evaluate the success of banding and the cardiac morphology and function. A high-frequency ultrasound system can be utilized to measure the diameter and flow changes in the left and right carotid arteries, to visualize the aortic arch constriction for peak flow velocity measurements, and to determine the left ventricle wall thickness and functional parameters7,8. After euthanasia, the organs can also be collected for histopathological studies with hematoxylin and eosin staining and Picrosirius collagen staining, the latter being particularly useful for the observation of fibrosis. The protocol follows the guidelines of the Committee on the Use of Live Animals in Teaching and Research (CULATR) at the University of Hong Kong. Disinfect the operation site with 75% isopropyl alcohol. Adjust the heating pad temperature to 37 °C to avoid changes in heart and respiratory rates of the subject animal. Use surgical instruments sterilized in a gravity displacement sterilizer at 121 °C for 30 min or by other appropriate methods. 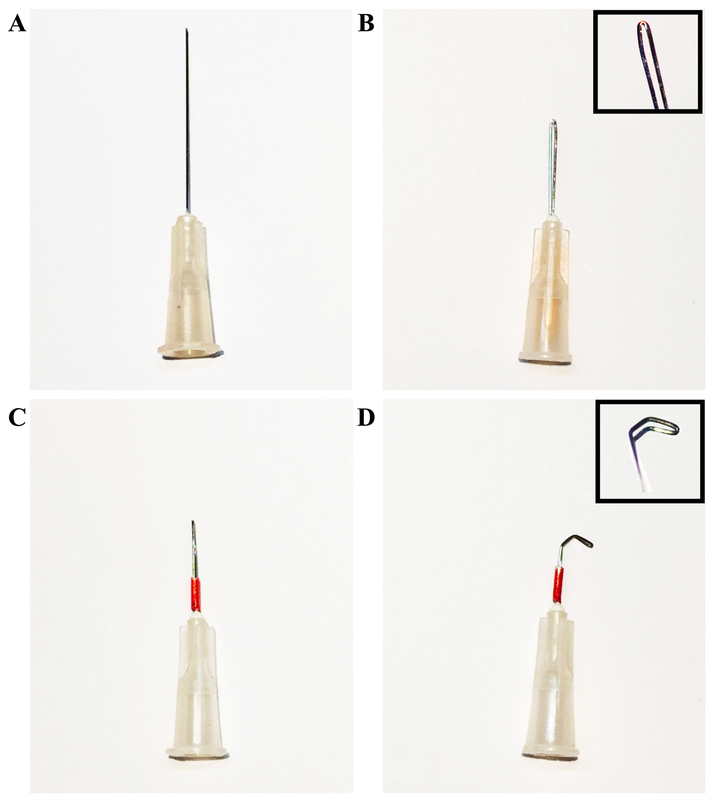 Take 2 - 4 30-gauge needles and curve them with a needle holder, as seen in Figure 1, to make a tool for ligation and tissue separation and for use as a retractor. Mount the now-curved needle on a cotton applicator for use in surgery. Blunt a 27-gauge needle and curve it 90º with the needle holder. Smooth the tip by rubbing a hard surface to make a 0.4-mm spacer in ligation step. Anesthetize a 2-month-old, male, 22-25 g C57BL/6N mouse with an appropriate ketamine and xylazine mixture in relation to body weight: 100 mg/kg + 10 mg/kg i.p. Confirm the anesthetization with the negative tail pinch reflex. Remove the hair on the anterior neck and chest with a 2- to 3-min application of depilatory cream. Remove the cream with warm water and a cotton applicator. Apply ophthalmic ointment or gel to the eyes of the animal to prevent the drying out of the cornea. Place the animal on a heating pad in the supine position and conduct intra-operative monitoring, being sure to keep appropriate documentation at every 15-min interval. Use surgical paper tape to secure the limbs to the heating pad in order to keep the animal in the correct position during the surgery. Disinfect the skin alternately with alcohol and povidone-iodine solution three times. Use a sterile drape with an exposed operation field to prevent contamination. Use new sterile gloves for each mouse and as necessary. Open the skin of the mouse at the midline position of the neck and chest with a scalpel. Pull the thyroid gland towards the head by gently separating connective tissues with blunt scissors. Separate the muscle layer on the trachea at the midline towards both sides with the curved needles. Using the blunt scissors, cut the sternum to the second rib (approximately 5 mm). Open the cut with a retractor or curved forceps. Separate the thymus lobes from one another and the lower chest wall by separating the connective tissue with the curved needle; the transverse aortic arch and two carotid arteries will be clearly visible at this point. 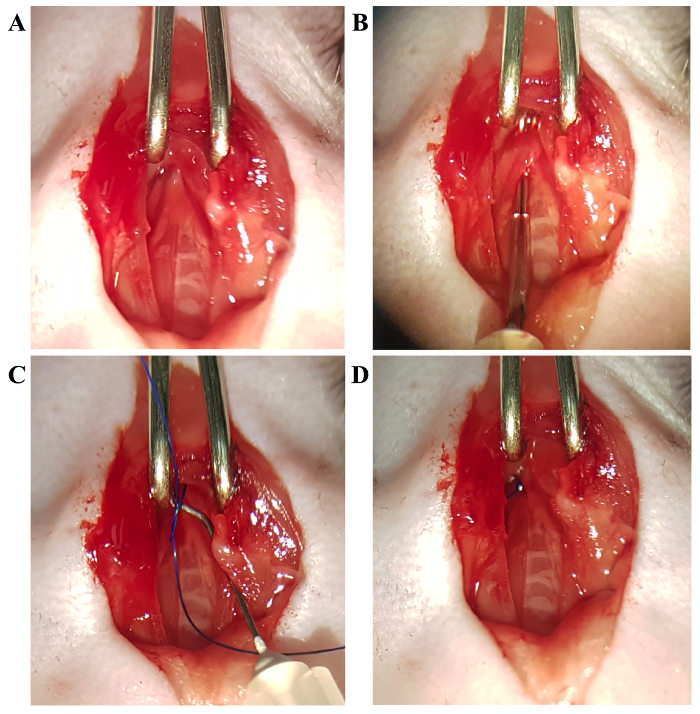 Place the curved needle under the arch and perforate between the vessel wall and connective tissue on the other side by pushing the curved head out. Using the curved needle, pull the 6-0 monofilament suture under the aortic arch. Place the spacer in the loop and fix the suture in place with a double-knot. Remove the spacer gently. Confirm a successful constriction with the knot position and cut the ends of the suture. Close the chest wall using 6/0 silk suture with a simple interrupted suture pattern. Close the skin with a 6/0 monofilament suture in a continuous suture pattern. Apply povidone-iodine solution to the suture site and place the animal in a pre-warmed cage for recovery and post-operative monitoring. Inject buprenorphine (0.05 - 0.1 mg/kg s.c. every 12 h) after the animal has regained consciousness to relieve pain and provide the mouse with appropriate soft food. Return the animal to a 12-h light/dark cycle room after full recovery. After one week, anesthetize the previously banded mouse with 3 - 5% isoflurane, for induction, and 1 - 1.5%, for maintenance, with a 1 L/min oxygen flow rate. Remove the chest hair using depilatory cream. Thoroughly remove the cream with warm water and a cotton applicator. Secure the mouse in the supine position to the animal-handling platform, maintained at 37 °C. Apply electrode gel to the paws and tape them to the pad with electrodes. Apply ultrasound gel to the mouse chest. With a 40-MHz MS550D probe and a high-frequency ultrasound system, perform color Doppler and pulsed-wave Doppler scanning on the left and right carotid arteries, as well as on the aortic arch. Using B-Mode, locate the left ventricle. Using M-Mode, the systolic and diastolic wall thickness can be measured. Use Cine Store and Frame Store to save data and images as required. Using B-Mode, locate the left common carotid artery before the branching point. Use pulsed-wave and color Doppler to evaluate the flow. Repeat with the right carotid artery at a similar point. Save the images in Cine Store and Frame Store modes to analyze later. Tilt the animal-handling platform to the far left so that the mouse is in the left decubitus position. Place the probe on the mouse, 30° offset from a position parallel to the head at the parasternal position, and manipulate X and Y to find the aortic arch. Locate the constriction. Use color Doppler mode to make the site of the constriction more visible, as blood will be flowing through a narrow channel between the point where the two carotid arteries branch out from the aortic arch. 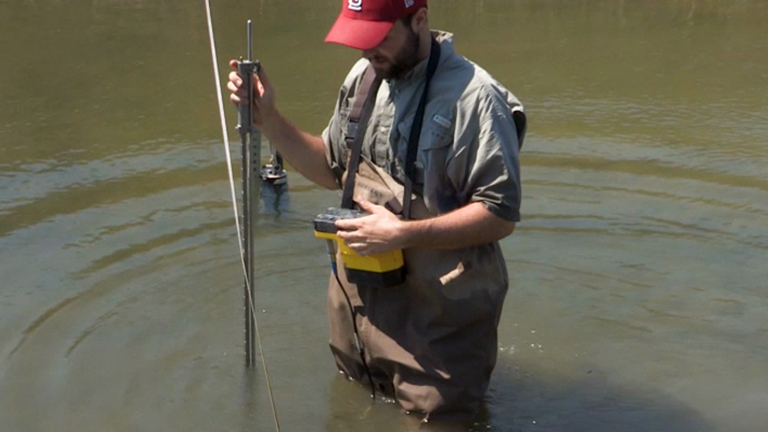 Use pulsed-wave and color Doppler to measure the peak flow velocity. Use Cine Store and Frame Store to save data and images as required. Allow the animal to recover on a heating pad in the prone position. Return the animal to the original cage in a 12-h light/dark cycle room after it has fully recovered from anesthesia. MTAC enables the induction of significant hypertension in the left ventricle in a timely manner. As seen in Figure 1, the preparation of the primary tools for the procedure is simple and minimal, requiring only 2 - 4 30-gauge needles to be bent and held in place with a polyurethane tube. The surgical procedure itself is also less complicated, as compared to TAC, and can be performed easily. Once the thyroid has been retracted, the sternum is cut and the thymus is moved to clear the view. The aortic arch is readily locatable for the ligation process (Figure 2). MTAC reliably produces left ventricular pressure overload in ligated mice. Figure 3 illustrates this clearly, as a constricted transverse aorta can be clearly observed in Figure 3C, as well as an increased peak flow velocity through the constriction site in 3D. This can be compared to the sham-operated mouse, seen in Figure 3A and 3B, which exhibits no constriction with normal peak flow velocity. As a consequence of the ligation seen in Figure 4C, the flow velocity is significantly increased in the right carotid artery, and pressure can build up the ascending aorta and in the heart to produce left ventricular hypertrophy. However, as a consequence of upstream constriction, the flow velocity is significantly reduced in the left common carotid artery, as in Figure 4D. On the other hand, near-identical carotid artery blood flow is observed in the sham-operated mouse, as in Figure 4A (right carotid artery) and 4B (left carotid artery). The resulting hypertrophy-related parameters and survival curve are readily observed in Figure 5, in which the heart of the MTAC-ligated mouse can be observed to be significantly enlarged and deformed. This is only further seen at the cellular level, as demonstrated in Figure 6A and 6B, which exhibits the enlarged heart of the MTAC-operated mouse as compared to the sham-operated mouse. What can be further observed is the increased cardiac muscle cell size and fibrosis in MTAC mice (Figure 6D, 6F, and 6H) compared to non-ligated mice (Figure 6C, 6E, and 6G). Since MTAC can be verified by a high-frequency ultrasound system, failure to successfully constrict the aortic arch will be revealed by a lack of a visible constriction of the transverse aorta in the two-dimensional echocardiography, as in Figure 3B and 3D. This can be further verified with the pulsed-wave and color Doppler modes, a successful constriction should demonstrate a higher flow velocity in the right carotid artery and reduced flow velocity in the left carotid artery (Figure 4C and 4D). Figure 1: Process of Forming the Desired Needle Hooks by Bending a 1-in, 30-gauge Needle Tip. A) The original 1-in, 30-gauge needle tip. B) Grasp the needle tip with the needle holder and bend approximately halfway along its length. Bend the needle into a loop, using the needle holder and the hands, as necessary, to form the loop pictured in the upper-right of the figure. C) Cover the needle with a polyurethane tube in order to hold the bent segment in place. D) Using the needle holder, bend the tip of the loop into the desired shape. In this case, a needle tip with two 45 - 60° bends has been shown for illustrative purposes. Please click here to view a larger version of this figure. Figure 2: The Process of Ligating the Transverse Aortic Arch. A) The aortic arch is clearly visible. B) Using the aforementioned hook needle, separate the aortic arch from the nearby connective tissue. C) Using the hooked needle, guide the suture under the aortic arch, and with the use of a spacer, tie a constriction of the desired diameter. D) Completed ligation. Please click here to view a larger version of this figure. 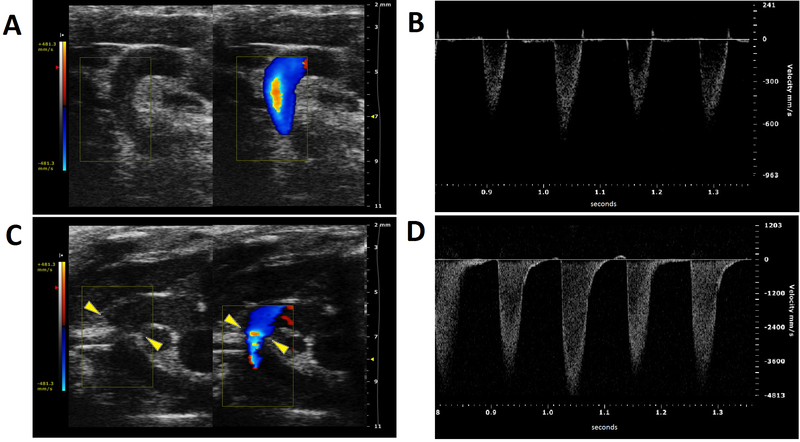 Figure 3: Color and Pulsed-wave Doppler Ultrasound Imaging from the Aortic Arch of Ligated and Non-ligated Mice. A) Color Doppler imaging of the aortic arch of a non-ligated mouse. The two carotid arteries are clearly visible, as well as the lack of a constriction between them. B) Aortic peak flow velocity of a non-ligated mouse. C) Color Doppler imaging of the aortic arch of a ligated mouse. The constriction between the two carotid arteries on the aortic arch is visible (yellow arrowheads). D) Peak flow velocity at the constriction site. Please click here to view a larger version of this figure. 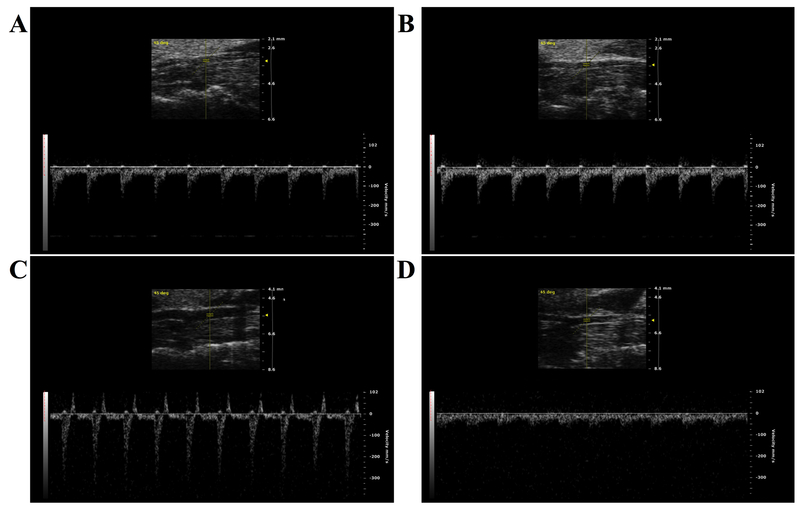 Figure 4: Pulsed-wave Doppler Imaging from the Left and Right Carotid Arteries of Ligated and Non-ligated Mice. A) Pulsed-wave Doppler imaging of the left carotid artery of a non-ligated mouse. B) Pulsed-wave Doppler of the right carotid artery of a non-ligated mouse. It is noteworthy that the velocity of the blood flow is nearly identical to that of the left carotid artery. C) Pulsed-wave Doppler of the right carotid artery of a mouse with a constriction on its aortic arch. The blood velocity is significantly increased due to the constriction downstream of the entry to the left carotid artery. D) Pulsed-wave Doppler of the left carotid artery of a mouse with a constriction on its aortic arch. The blood flow velocity is significantly reduced due to the constriction upstream to the entry of the left carotid artery. Please click here to view a larger version of this figure. Figure 5: Cardiac Hypertrophy and Related Parameters with a Survival Curve from 3-week Ligated and Non-ligated Mice. A) The heart from a 3-month-old mouse without transverse aortic constriction. The heart is healthy and of a normal shape, without any immediately evident pathologies. B) The heart of a 3-month-old mouse that underwent MTAC for 3 weeks. Notice the clearly misshapen nature of the heart due to left ventricular wall enlargement. The ligation on the aortic arch is also visible. C) A cross-section of the heart of a 3-month-old non-ligated mouse. D) A cross-section of the heart of a 3-month-old mouse that underwent transverse aortic constriction for 3 weeks. The enlargement of the left ventricle is clearly visible. The heart in general is also enlarged due to the left ventricular pressure overload caused by MTAC. E) The heart-to-bodyweight ratio is significantly increased in mice banded for 3 weeks. F) The heart-to-left tibia bone length ratio is significantly increased in mice banded for 3 weeks (*, p< 0.05; **, p< 0.01; ***, p< 0.001). G) Survival curve for a 3-week-long experiment (MTAC = 12 and SHAM = 12). Please click here to view a larger version of this figure. Figure 6: Histological Slides of the Mouse Heart. A) A cross-section of a sham-operated mouse heart. B) A cross-section of a heart MTAC-ligated for 3 weeks, with a thickened left ventricular wall and partial fibrosis. The overall heart size is increased as well. C) Longitudinal section of cardiac muscle fibers from a sham-operated mouse. D) Longitudinal section of cardiac muscle fibers from an MTAC-ligated mouse. The cells are enlarged significantly, as evidenced by their increased diameter, while the nucleus has remained the same size. E) Transverse section of muscle fibers from a sham-operated mouse. F) Transverse section of cardiac muscle fibers from an MTAC-ligated mouse. The cells are enlarged due to the pressure overload as a result of the MTAC. G) Coronary arteries from a sham-operated mouse stained with Picrosirius Red for collagen. H) Coronary arteries from an MTAC-ligated mouse. A significant amount of collagen tissue is observed around the dilated blood vessel, indicative of perivascular fibrosis due to the pressure overload in the coronary arteries. Please click here to view a larger version of this figure. Rockman and colleagues devised the first method for aortic banding as a method to study pressure overload in the heart. This enabled research to begin to uncover the cellular and molecular consequences of hypertension and heart failure1. An improved method, minimally invasive transverse aortic constriction (MTAC), provides an amenable, time-dependent method for the induction of left ventricular pressure overload and heart failure, without the drawbacks of the conventional transverse aortic constriction9. The procedure itself can be performed significantly more easily and with increased survival rates as compared to TAC. The main advantage of this method is that it enables the performance of the aortic constriction experiment, but with significantly less equipment, surgical skill, and operation time for the same or a better outcome. The open-chest method in the TAC procedure does enable greater access and a better view of the entirety of the heart and vessels. The potential advantage is that it can be easily conducted in combination with other procedures, such as the performance of pulmonary artery constriction for right ventricular pressure overload or coronary artery ligation for ischemic conditions at the same time as the aortic arch banding is done. Conversely, the minimally invasive method is not suitable for anything other than ascending or transverse aortic arch constriction. It is noteworthy that this method has been adapted and modified in a variety of ways. In some cases, the use of titanium clips instead of a suture to constrict the aorta has been deemed more appropriate, given that it is an experimental condition that is easily reproducible: the bands cannot slip off as they can in standard TAC and MTAC procedures involving sutures6. In the event that, when tested with the high-frequency ultrasound system, a great number of mice have not been successfully ligated during the experiment, further practice is required. Perhaps the application of the aforementioned titanium clips may improve the success rate of the surgery6. When conducting the experiment, it is critical that the suture around the aorta is not too tight. It may injure the aorta or cause a fatal reduction of blood flow to the rest of body, including the critical organs, such as kidneys. Care also must be taken to be gentle when using the curved hook to separate the aorta from the surrounding connective tissue and vessels, as it can injure the pulmonary veins and other vessels and can lead to fatal blood loss. The chest cavity has negative and the outside environment has positive pressure. In this procedure, though the chest wall was cut open from the sternum and the aortic arch was banded, the chest cavity and negative pressure environment were intact. If there was accidental damage and the inside negative pressure was changed, the lungs would have collapsed, and the animal would have died instantaneously, since there would have been no positive pressure ventilation. Usually, the procedure can be safely performed within 30 min, even with slow performance, if there is no fatal injury. Post-operative care is also critical, since the pressure can be reduced if the animal is dehydrated, or the animal can starve due to pain and difficultly in reaching the food. Easily available soft food, analgesics, and rehydration are essential for recovery, as well as for a successful outcome. The subsequent use of ultrasound systems, particularly the color Doppler mode, enables the visualization of the transverse aortic arch, the successful constriction, and the effects of MTAC. The ultrasound system enables the measurement of flow velocity in carotid arteries, of the thickness of the arterial walls, and of the morphology of the left ventricle. Notably, the ratio of flow rates in normal or sham-operated mice should be approximately 110. The peak flow velocity in the constriction site can be used to calculate the pressure gradient using modified Bernoulli's equation (4 x Vmax2) for a reliable parameter as the carotid ratio. It is worth noting that during the echocardiography, that body temperature and heart rate must be kept as close as possible to the normal physiological range and should be similar between animals to produce comparable data points10. Varying levels of constriction can be derived from different experience levels of operators and can significantly influence the obtained morphology. To get consistent results, checking successful constriction with pressure gradient levels and only using mice within certain limits, such as a pressure gradient between 40-80 mmHg, is important. Whenever possible, high-frequency echocardiography should be used for confirmation and animal selection criteria to achieve consistency in the study outcomes. However, echocardiography is not necessary for the MTAC method itself. If high-frequency echocardiography is not available, the successful constriction can be verified with heart weight and relative ratios and with the histopathological study at the end of the experiment. The successful constriction will increase lean heart weight and the relative ratio to body weight and left tibia bone length. Similarly, cardiac muscle cell hypertrophy and both interstitial and perivascular fibrosis can also be observed in successfully ligated mice. This 3-week-long experiment is intended only to induce cardiac hypertrophy, but not to cause a failure. The cardiac dilation and heart failure usually set in after 6 - 8 weeks or later. We would like to acknowledge the University Research Facility in Life Sciences (ULS) of The Hong Kong Polytechnic University for the provision of Vevo 2100 ultrasound system. Special thanks to Dr. Chunyi Wen from the Interdisciplinary Division of Biomedical Engineering, Hong Kong Polytechnic University, for training and facilitation. This work was supported by HK government RGC Grant GRF 17127215, 764812 and HKU6/CRF/11G to Billy K C Chow. Sterile gloves A.R. Medicom, Inc (Asia), Hong Kong. Rockman, H. A., et al. 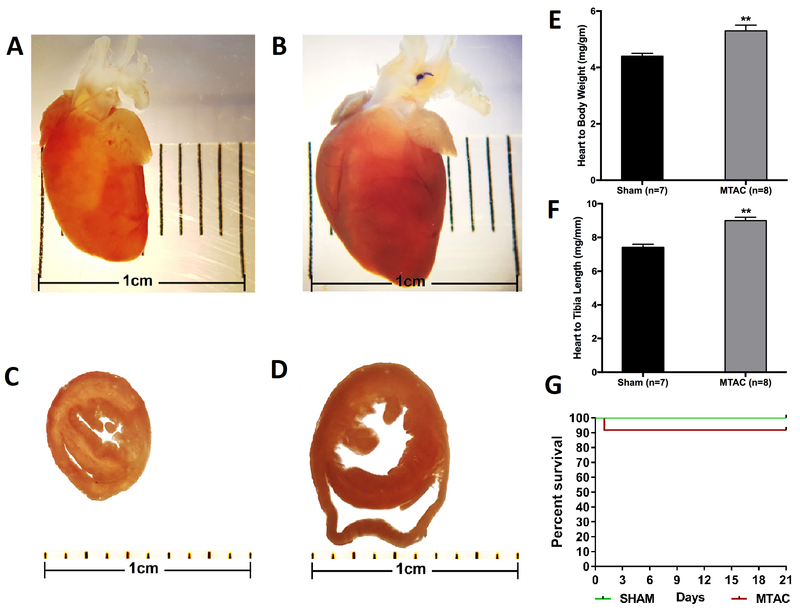 Segregation of atrial-specific and inducible expression of an atrial natriuretic factor transgene in an in vivo murine model of cardiac hypertrophy. Proc Natl Acad Sci U S A. 88, (18), 8277-8281 (1991). de Almeida, A. C., van Oort, R. J., Wehrens, X. H. Transverse aortic constriction in mice. J Vis Exp. (38), (2010). Hu, P., et al. Minimally invasive aortic banding in mice: effects of altered cardiomyocyte insulin signaling during pressure overload. Am J Physiol Heart Circ Physiol. 285, (3), H1261-H1269 (2003). Shimizu, I., et al. Excessive cardiac insulin signaling exacerbates systolic dysfunction induced by pressure overload in rodents. J Clin Invest. 120, (5), 1506-1514 (2010). Tarnavski, O. Mouse surgical models in cardiovascular research. Methods Mol Biol. 573, 115-137 (2009). Zhang, X., et al. A modified murine model for the study of reverse cardiac remodelling. Exp Clin Cardiol. 18, (2), e115-e117 (2013). Hartley, C. J., et al. Doppler estimation of reduced coronary flow reserve in mice with pressure overload cardiac hypertrophy. Ultrasound Med Biol. 34, (6), 892-901 (2008). Scherrer-Crosbie, M., Thibault, H. B. Echocardiography in translational research: of mice and men. J Am Soc Echocardiogr. 21, (10), 1083-1092 (2008). Faerber, G., et al. Induction of heart failure by minimally invasive aortic constriction in mice: reduced peroxisome proliferator-activated receptor gamma coactivator levels and mitochondrial dysfunction. J Thorac Cardiovasc Surg. 141, (2), 492-500 (2011). Li, L., et al. Assessment of Cardiac Morphological and Functional Changes in Mouse Model of Transverse Aortic Constriction by Echocardiographic Imaging. J Vis Exp. (112), (2016).